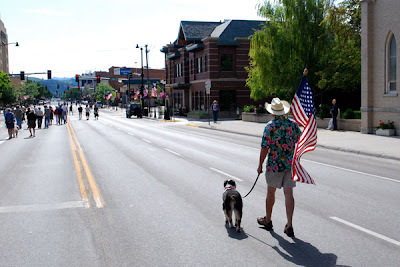 The Fourth of July is a time for patriotic reflections, of course, but in Bozeman this year it was also a venue for political expression. There were two marches down the town's Main Street yesterday morning ... one was sponsored by an angry, far-right group, but the other was far more good-natured, designed to poke a bit of fun at the right-wingers. My dog and I marched with the latter group, a very genial bunch united under the satirical name, "The Green Coalition of Gay Loggers for Jesus." It was a fine time, and the perfect way to celebrate the Fourth. I took this photo a few minutes after the march ended, and it seemed like a good reflection of the holiday. But yeah, it's better off if you know it now: my politics do mostly lean to the left. (The long hair is a dead giveaway!) But I"m definitely not a hard-core ideologue about a lot of that stuff, and some of my political opinions aren't too easily categorized. Besides, with just rare exceptions like this one, this absolutely isn't going to become a political blog -- I think the topic of Montana is much more interesting! Heh ... thank you! I've gotten a surprising amount of grief from friends for participating in that little event -- mostly from right-wingers, of course, but also from a couple of too-politically-correct folks on the left. Which is really too bad: life is far too short not to laugh at the goings-on as often as you can.